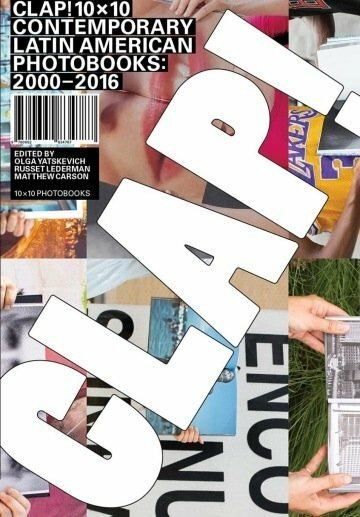 A photobook anthology that documents CLAP!, a traveling reading room exhibition of 130 contemporary Latin American Photobooks from 2000 to 2016. Organized by 10×10 Photobooks, the project launched at the PGH Photo Fair at the Carnegie Museum of Art in Pittsburgh (May 2016); then traveled to the Aperture Foundation in New York City (November 2016) and the Museum of Fine Arts in Houston (March 2017), where all the books in the CLAP! reading room were donated as a complete collection to the museum’s Hirsch Library. The project will conclude at FoLa: Fototeca Latinoamericana in Buenos Aires in November 2017. Selected by 12 Latin American specialists (either in teams or individually), the books presented offer a range of recently published Latin American photobooks that are rarely seen or available outside the region. The selected books represent many of the most exciting innovations in Latin American photography and publications. Copiously illustrated and indexed, the CLAP! publication provides full color spreads and detailed bibliographic information for all 130 photobooks included in the reading room. Designed by Ricardo Báez, CLAP! includes essays by Luis Weinstein and Joaquim Marçal F. de Andrade. Text: Yatskevich Olga, Carson Matthew et al. cm 20×29; pp. 244; paperback. Publisher: 10×10 Photobooks, New York, 2017.